It is okay if a couple have serious problems and decide to call it a day for sometime. And in a very serious issue involving cheating on ones spouse and the one being cheated could not forgive,it is also okay to have a clear breakup and divorce. What is considered as bad is when one of the partners vent his anger,disappointment or frustration on his or her children. Already the kids have enough troubles to battle with as a result of your problems. The pictures above are those of a father and his daughter. 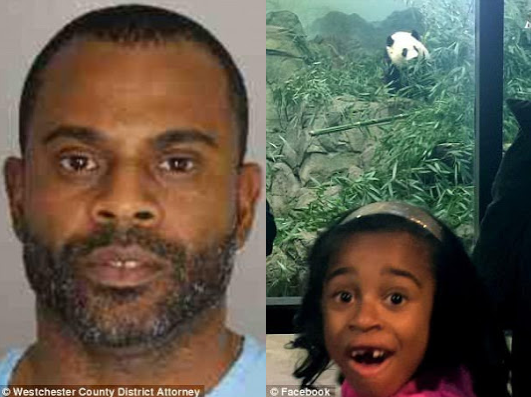 Simply put,the wife of the man filed to divorce him,and the only thing he could do was to choke his seven year old daughter to death. What has their daughter got to do with his wife filing to divorce him? Why should this innocent child be the one to pay the price of her parental divorce? Okay,the reasons why the NBC vice president filed to divorce her husband was not disclosed to us. But we could very well tell that this man,the murderer of his own flesh and blood must have been so blood thirsty,and that his wife would have had it all around her neck. This man must have been a very terrible person to live with that we could say kudos to his wife for having stayed,lived and shared over seven years of her life with him. Any man who could hurt his children because he has some crash with his wife is a fool! There is no coward that can be compared to him. Therefore,he has our highest award of cowardice given to fools like him. Congratulations!! Yes,the big headed man up there truly deserves to be given a very hot divorce certificate. In fact,he does not in anyway deserve to have the pleasure of having a woman in his wife. What else should we say ? One day,you will see another beautiful and well to do woman in his hand. Poor women! !